Athertyn is comprised of much more than luxury homes. 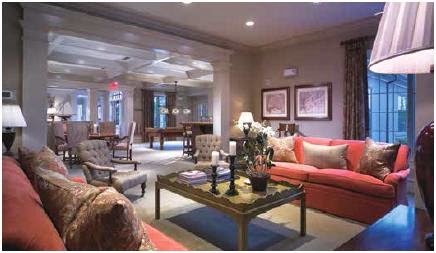 The central meeting place is the community’s exquisite clubhouse. Upon arriving, you’re struck by the distinctive club room with its handsome bar, billiard table and flat screen televisions. Adjoining rooms include cozy space for card games, an executive-style library and conference room, and the great room with its own catering kitchen to serve parties of varying size. The light-filled fitness center occupies another wing of the clubhouse. Club-style locker rooms provide a place to change for your full-body workout on state-of-the-art equipment or in a group exercise class. Outside, a shimmering pool invites you to take a dip or relax on the patio. 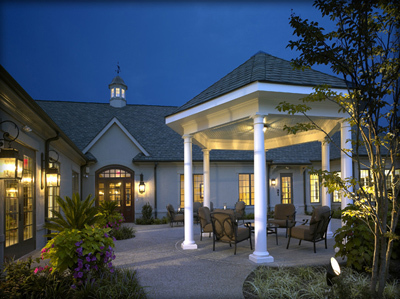 Steps away are a tennis court and putting green as well as miles of picturesque walking trails. You can bet your new neighbors will happily invite you to join the social clubs, attend a private party, or participate in one of the many community events held at the clubhouse. Living healthy is important at every age, and boomers are embracing yoga in greater numbers because of benefits like increased muscle strength, improved balance, enhanced mental clarity, and improved sense of well-being. Yoga classes are held regularly in Athertyn’s Clubhouse where the instructor tailors the class to suit the expectations of each individual.